Mary M. Woodson 88, of Plainfield, passed away on August 15, 2018 in I.U. West Hospital. Mary was born on December 10, 1929 in Indianapolis to Vern and Ann Pfaffenberger Hooser. She graduated from Washington High School and married Jack Woodson, her sweetheart. They were married almost 66 years. Jack preceded her death in 2014. Mary spent many years working for the Wayne Township school system where she met lifelong friends. Mary loved to watch sports on TV and spending time with her family and friends. As time went on, she lost most of her hearing and eye sight but still enjoyed visits from friends and family. She never lost her love for Bobby Knight and IU basketball. 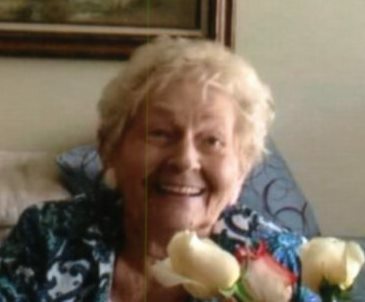 She was a home decorator and even though she couldn’t see well, she loved her trips to Hobby Lobby and kept her apt as up to date as possible. She will be missed by all that loved and knew her. Survivors include her children: John (Donna) Woodson, Mike Woodson, and Suzy (Mark) Swick. Grandsons: Michael (Melissa), Jesse (Andrea), Wesley (Angela) Woodson, Aaron, Kyle (Alyssa) Swick. 8 Great grandchildren. She was preceded in death by her son Scott Lee Woodson and a brother Lafayette Hooser. Funeral services will be held on Saturday, August 18, 2018 at 2 p.m. in Hall-Baker Funeral Home, Plainfield. Calling hours will be from 11 a.m. until services in the funeral home. Private entombment will take place in Floral Park Cemetery. In Lieu of flowers please make donations to your favorite charity.